There are many ways to save with shopping online and in-stores, but one way you may not have thought of is getting discounts on gift cards and even selling gift cards you won’t use. 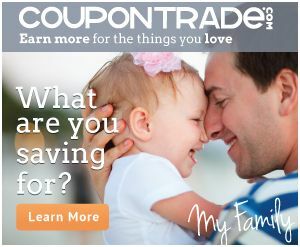 There is a great site to check out for this called CouponTrade.com. As we enter the holiday season (yep, it’s here) you can head online and grab gift cards before you head to the local store or online to buy people’s presents. If you are headed to Target, you can grab a Target $100 gift card online and only pay $94 dollars for it. Then go into the store and save even more with sales and coupons. You’ve already saved some though by thinking ahead and scoring a discounted card. One hesitation I had was, do they verify the value of a gift card that is posted for sale… turns out they are able to electronically verify each card before it’s listed to make sure it is the value the seller states. On the flipside, gift cards can make for easy presents to give. So for all of us that end up getting gift cards to stores we will never shop at think about selling them for cash! I have done this twice recently. I was given a gift card to AMC theaters, which was nice but the nearest one to me is across town and I only tend to see movies in a theater once every 3-4 years… so I put it up for sale and sold my $25 gift card for $21. I lost a little of the value but in return I had $21 to use in a different way. CouponTrade.com will let you choose payment by paypal, check or an instant Amazon gift card. Right now CouponTrade is giving you a chance to try out selling a card with no listing fees (up to $1.75 savings)! Use code SOUTHERNSAVERS, to get the discount. Note, if you choose to be paid via paypal you will still have paypal fees. Yesterday I decided to test out their sales, so I listed a $100 Walmart gift card for $94. It sold within 2 hours of being listed. I probably should have asked a few dollars more, but overall I’m happy with not having to wait. I know it’s hard to get over the $6 loss, but for me that was money that I could turn around and use to pay other things (like bills). Either way you use a service like CouponTrade I see it as having benefits. You either save even more on the shopping you already have to do… or you make a gift card more useful to you as cash! Have you ever tried buying or selling gift cards?